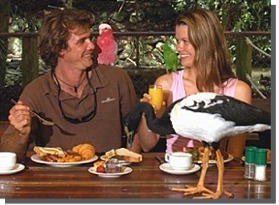 Port Douglas is home to one of the Tropical North's best Wildlife Parks - the Wildlife Habitat. Made up of wetlands, rainforest and grsslands displays it's also home to 2 great dining experiences - Breakfast with the Birds and Lunch with the Lorikeets. Both these options include the standard wildlife park entry. North Queensland is home to the Saltwater Crocodile, and you can get up close and personal with these creatures on a Daintree River Crocodile Cruise or a visit to Hartleys Crocodile Adventures.